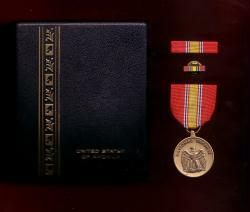 US National Defense Service medal in case with ribbon bar and lapel pin. Decoration set. On a Bronze medal, 1 ¼ inches in diameter, an eagle displayed with inverted wings standing on a sword and palm branch, all beneath the inscription "NATIONAL DEFENSE". On the reverse is a shield taken from the Coat of Arms of the United States with an open wreath below it, the right side of oak leaves and the left side of laurel leaves. The ribbon is 1 3/8 inches wide and consists of the following stripes: 7/16 inch Scarlet 67111; 1/32 inch White 67101; 1/32 inch Old Glory Blue 67178; 1/32 inch White; 1/32 inch Scarlet; center ¼ inch Golden Yellow 67104; 1/32 inch Scarlet; 1/32 inch White; 1/32 inch Old Glory Blue; 1/32 inch White; and 7/16 inch Scarlet. a. Guard and Reserve forces personnel on short tours of duty to fulfill training obligations under an inactive duty training program. b. Any person on active duty for the sole purpose of undergoing a physical examination. c. Any person on temporary active duty to serve on boards, courts, commissions and like organizations or on active duty for purposes other than extended active duty. d. A one time only exception, for members of the Army National Guard and United States Army Reserve, who were part of the selected reserve in good standing, was authorized, per executive orders 12778, dated 18 October 1991, for the period 2 August 1990 to 30 November 1995. The National Defense Service Medal may be awarded to members of the Reserve Components who are ordered to Federal active duty, regardless of duration, except for the categories listed above. Any member of the Guard or Reserve who, after 31 December 1960, becomes eligible for the Armed Forces Expeditionary Medal, Vietnam Service Medal or the Southwest Asia Service Medal is also eligible for the National Defense Service Medal. To signify receipt of a second or subsequent award of the NDSM, a bronze service star will be worn on the service ribbon by U.S. Army personnel so qualified. Second or third award of the NDSM is authorized for soldiers who served in one or more of the four qualifying time periods. It is not authorized for soldiers who met the criteria in one time period, left active duty and returned during the same period of eligibility. Cadets of the U.S. Military Academy are eligible for the NDSM, during any of the inclusive periods listed above, upon completion of the swearing-in ceremonies as a cadet. The NDSM may be issued posthumously. b. Ribbon: MIL-DTL-11589/97. NSN 8455-00-264-1478.